Our Trust was established in 1983 by our founder trustee, Shri Chhotubhai A. Patel fondly known as Bapuji. The Trust was originally created as a funding agency for health and educational activities. After a period of about 10 years, our founder trustee thought it fit to establish Hospital & School at Mota Fofalia, with a view to undertake rural development activities to uplift the people socially, educationally and culturally by providing facilities which are available to the people of urban areas. Trust thought it better to translate ideas into practice by establishing a model project of the Community Health Centre under Public-Private Partnership (PPP) with the support and co-operation of the state government. After working for a period of about 5 years in the area of health and rural development, Trust started educational activities of International standard in the village of Mota Fofalia. One of our rural development projects, Total Sanitation Campaign (TSC), implemented with astounding success at Mota Fofalia village with the co-operation of beneficiaries, earned the recognition from the Government of India in the form of “Nirmal Gram Award” by the President of India in 2006. In the year 2013, The Trust has started children’s hospital adjoining the existing hospital and community health center in collaboration with the UK based Lions Club of Moor Park which caters to the acute and chronic health care needs of the pediatric population within the rural area. Our Hospital awarded as a best Community Health Centrestrong> in the Vadodara district by Health & Family welfare department of Gujarat under the scheme of “KAYAKALP” -an initiative for awards to public health facilities by government of India in 2016. 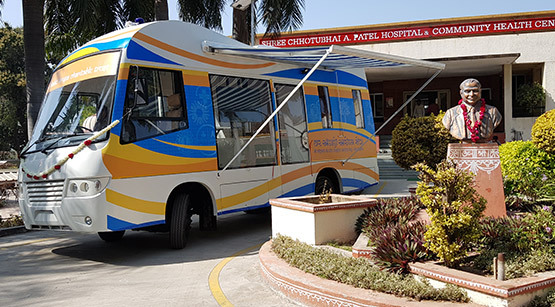 Today in the absence of Bapuji, his philanthropic legacy is carried on by chief patrons of the trust, Dr. Kiran Patel, Dr. Dinesh Patel and Mr. Pradip Patel, personally involved in the development of the hospital & school, as well as providing financial aid to the trust.